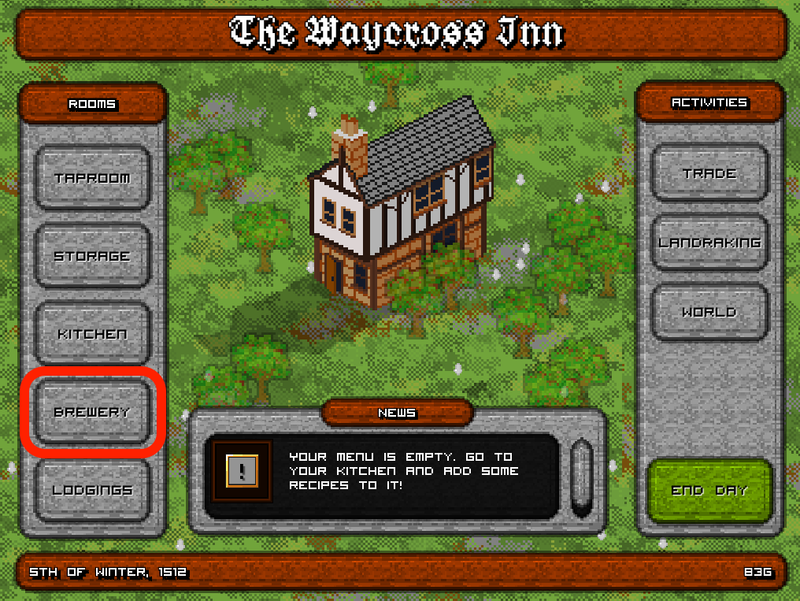 The gameplay elements of The Waycross Inn are currently undergoing their second design pass, and some of them are starting to look presentable enough that I can cover them in detail in a dev diary. the first of these i’m going to tackle is the brewing process. Obviously, this is still very early development. Screens and art may change. There are a lot of ways to keep your tavern profitable, and the most obvious one is to sell booze! 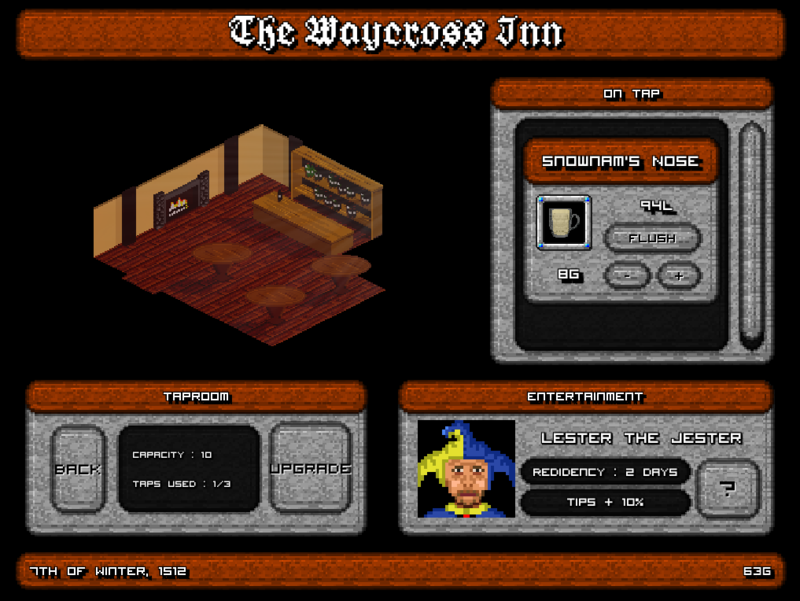 In The Waycross Inn, you don’t just sell drinks, you actually concoct your own drinks. Alcohol can be made from anything that has starch or sugar in it, the yeast just love that stuff! It isn’t a ‘Simulation’. 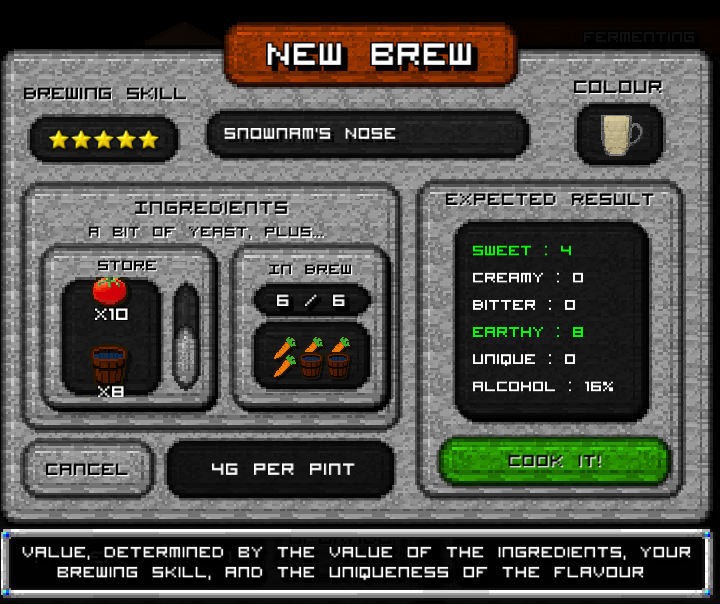 Some of the less interesting parts of real life brewing ale making have been removed or streamlined. In this world, wines, bitters, spirits, ale’s… they’re all the same, and they’re called ‘Brews’. 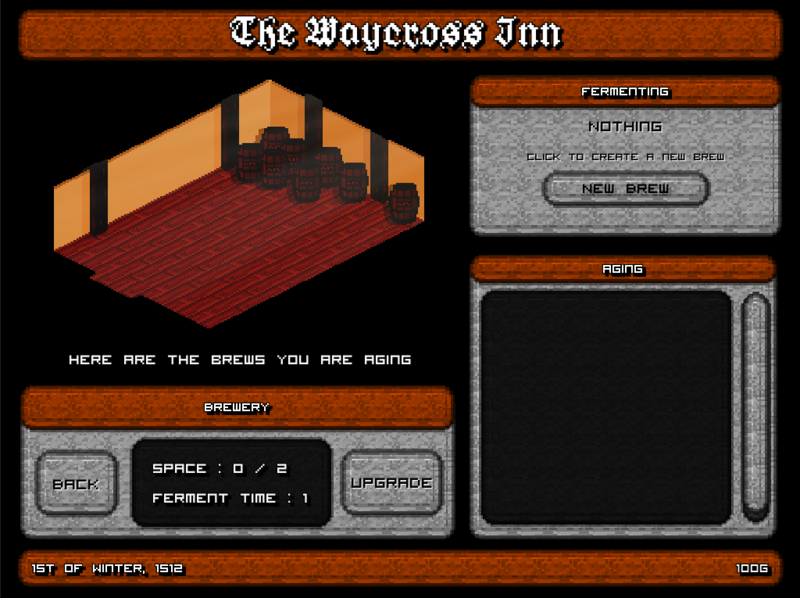 First thing to do will be to click the ‘Brewery’ button on the main page, and you’ll be taken through to your own personal brewery. 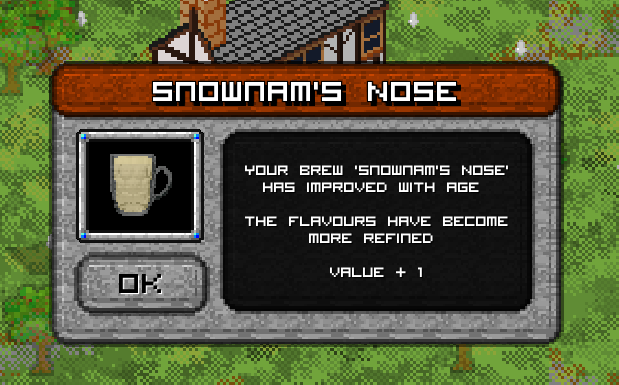 You can make a brew out of anything in the game. Each ingredient has a specific flavour, alcohol potential, colour, and you can mix up to six of them together to make a brew. Make a brew from fish heads? Or perhaps a nice earthy, bitter malt from all the rats you find in your storeroom? You may even happen upon a mysterious vegetable the likes of which the world has never seen, and create a legendary ale which rockets your taverns reputation skyward. Here, I’m making a simple ale out of carrots, watered down a little so it’s not so alcoholic. The last thing to do is to give it a name, cook it up and set it fermenting! 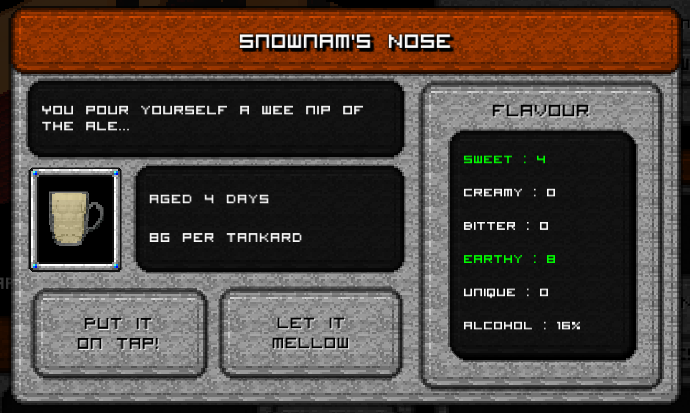 After clicking the cook button, the ale will move in to the fermenting tub, and the time left to ferment is displayed in the ‘fermenting’ section of the distillery. Fermentation is where the yeast turns all the sugar and starch into alcohol. After a week or so of fermenting, the brew is transferred into a barrel and moves to the cellar, where it sits and ages. During the ageing process, brews can take on new properties and improve. For the sake of fun, the ageing process is much faster in the game than in real life, and you should start to see results within a few days. At any point during the process, you can have a wee taste and see how the brew is doing. And if you decide it’s ready, you can prepare it for the taproom, or leave it to age some more. And of course, once you’ve determined it’s ready, you can plug it, put it on tap, and start serving it to your guests! You can determine the selling price here too. People in this world are very aware of the value of things, and will know if they’re being overcharged, or getting a good deal. This may not have any effect on whether they buy it or not, but they might leave with a slightly better or worse opinion of your establishment. I hope this gives you some insight into how this part of the game will work anyway. It’s likely to become much more complicated as the design becomes more refined with age (Like a fine wine). If you’re interested in this game, and have any questions or comments, PLEASE ASK THEM because It’ll make me think about things more. YOu can leave a comment here on the site, or catch me on Twitter at @StewHogarth. Stew started Smiling Bag in October 2013, launching it into the public eye with its debut title ‘I Am Level’.